This small summit does not look like much on the map. It just seems to parallel N202 for a short distance. But in reality there is also a moderate 250m climb involved to get across a shoulder between the Gorge of the Var and the Gorge of the Vesubie. Along the way are some nice views and a small picturesque hilltown. As a side effect you also escape the traffic of the Var valley. This summit can be seen as a precursor to an adjacent summit to the north: The road to the D32 Utelle summit(u) also cuts across a canyon ridge, jutting out over the Vars valley. From West. There are two possibilities to branch off N202 and join this little road, that does not seem quite so little once you have ridden over it. I took the eastern turnoff onto D26, across a narrow bridge, singed direction Massoins. That is the name of the first town perched on the hill, but not the highest. That comes in the village of Tournefort, together with a far view of the mountains in the Mercantour Park. From East. (described downwards). Across the Gorge de la Vesubie, you can see the opposite climb to La Tour and onwards to Utelle. But the descend traverses up the Tinee valley and spits you out on the valley floor quite a distance north. 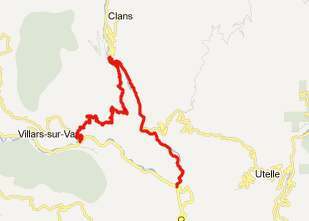 The elevation profile continues to descend the Tinee to its junction with the Var. D32 Utelle s(u) , D32 La Tour s(u) , D26 Tournefort s(u): Entrevaux > N202 east > D26 Tournefort s(u) > D32 La Tour s(u) > D32 Utelle s(u) > D2565 north > Lantosque: 55.2miles with 5290ft of climbing in 5:37 hours on a fully loaded mountain bike (VDO MC1.0: m4:12.5.24).